Be a Japanese samurai! Learn the spirit of the martial arts! This is the ideal experience for travelers curious about the world of Japanese Samurai warriors. You won’t have to worry about buying expensive martial arts gear, as Kendo uniform rental is included. 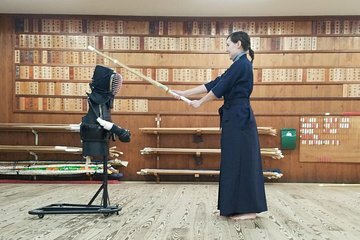 The experience is perfect for beginners as you’ll learn the background and rules of Kendo. Enjoy step-by-step instructions, a demonstration, and an interactive training session. At the end of your experience, you’ll get a certificate, a photograph with the master, and a towel headband souvenir. The program is aimed for people aged 10 and older. But the age requirement is negotiable.